The maintenance is Easy: About once a week I used a funnel (which I just left with the buckets so I wasn't having to go look for it) to guide water into the water tube. Sometimes I forgot, and the plants got droopy. As soon as I filled their reservoir of water, they perked up and were happy again for a week or more. During the driest and hottest weeks of summer, I watered them twice a week. 1. They did need regular watering. However, the reservoir kept the plants happy for a week or more. Despite giving the same amount of water to both buckets, one of the plants definitely did better. The pepper plant closer to the house made lots of peppers, but they were all tiny and slow-growing, never reaching full size. The other plant grew bigger and better peppers. The only variable I can think of is that sometimes the eaves on the house prevented full rainfall from showering down on the plant closest to the house, so the pepper closest to the house had more of a challenge with water. I found that the buckets did better when I mulched the surface of the soil with straw, as recommended by Weekend Vegetable Gardener. 2. 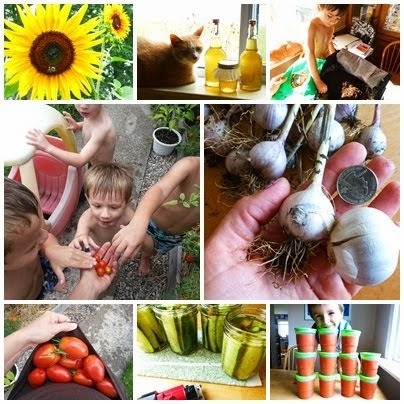 They grew better and produced more than the plant in a regular flowerpot. I didn't purposely plan for it, but I ended up with a control plant. A pepper was growing in a large flowerpot completely by accident. I had laid a transplant in the pot (it was just full of soil at the time, nothing else) as a reject. I had not intended to plant it because it was the smallest and spindliest of the transplants. It went on to plant itself, much to my surprise, and produce three peppers. 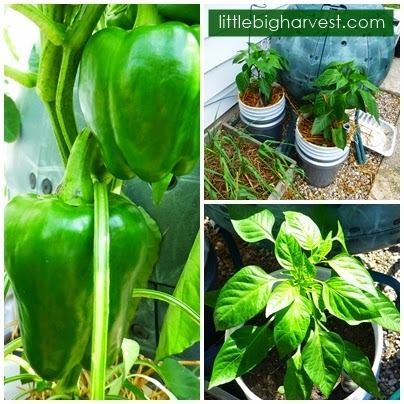 The lesser performance of the flower pot pepper compared to the earth buckets could have been related to the fact that it wasn't the strongest transplant to begin with, but I have tried to grow peppers in regular flower pots before with similar results. Verdict: Since I've been trying to grow peppers in my raised beds (and in large flower pots, too) for three years in a row without a single pepper to eat, I consider the buckets a huge success. I will be making at least 5 more buckets to place along the edge of our back patio next spring, which gets a lot of direct sunlight each day. I will either use them to grow peppers or tomatoes, or if I can figure out a trellis system, I might try to grow vining plants such as squash or pumpkins. I'll be sure to post an update in the coming spring! If you'd like to try earth buckets out in your limited or unused spaces, remember to read my tutorial here!